When you have lost one or more teeth, you aren’t just missing the visible tooth — the supportive root structure is gone, too. This portion of the tooth brings blood flow and important nutrients to the jaw. Without all of your teeth roots, the jaw will wither and shrink over time. Dental implants prevent this degeneration by providing a prosthetic titanium root, for a strong and sturdy tooth replacement! Because they provide a comprehensive solution that stabilizes the jaw, dental implants also promote better oral health and prevent the loss of additional teeth over time. 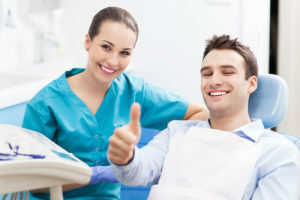 Plus, a tooth that is retained by a dental implant is as easy to thoroughly clean as the rest of your smile — reducing your risk of developing cavities and gum disease. Unlike a non-implant retained denture, dental implants fit properly from day one and stay sturdy for years to come. Patients who deal with a loose or ill-fitting denture may have to limit their diets to what is soft and easy to eat — not so with dental implants. Thanks to their stability and security, you can maintain a balanced, nutritious diet of all your favorite foods for life. Dental implants are nature’s rival in tooth replacement. After you have had teeth replaced with this option, you probably won’t be able to tell any difference between the prosthetic and your natural teeth — and other people certainly won’t. Furthermore, because dental implants stabilize the jaw bone, they also help you to retain your voluminous facial structure, without developing the sunken look that is common with older age and tooth loss. Most adults who have suffered tooth loss are eligible for dental implants. To find out whether or not you, too, can benefit from implants, do not hesitate to get in touch with your implant dentist! You deserve these 4 benefits of dental implants — plus all the others that are associated with this tooth replacement option! 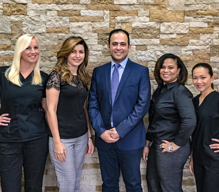 Dr. Racha W. Kadamani and the team at Laith Family Dentistry offer comprehensive general, restorative, and cosmetic dental services — including high-quality dental implants. To learn more about this wonderful method, you are invited to contact the team at 210-782-6842.